Seven-year-old Geovany has certainly sparkled in both his classroom and in the community. Geovany moved into the La Costa Paloma community in Carlsbad three years ago. When he first started attending CHW's afterschool learning program, Geovany had trouble focusing. It was difficult for him to listen and participate in the Community Center programs. Some homework and afterschool program coaches found it difficult to work with Geovany because of his energetic nature. When Geovany’s mother, Viviana, and the Community Building Coordinator spoke, they brainstormed to find ways to help Geovany with his focus. After visiting a pediatrician, Geovany was later diagnosed with ADD and ADHD. Soon after, with the support of his school and family, he was placed on an Individualized Education Program for a customized learning plan to better fit his educational needs. Today, with the help of the Study Stars program and his Community Building Coordinator, Geovany has made big improvements as a Study Star. He now loves coming to CHW's afterschool program and rarely misses a session. Geovany’s tutors have learned how to better work with him based on his unique learning style needs, and look forward to tutoring Geovany with patience and attention. Through the Community Center, Geovany is now using I-Ready, an e-learning educational resource, and is reading at grade level! 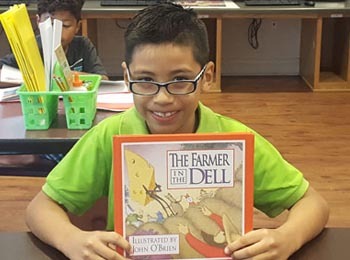 The care of the Community Building Coordinator and coaches in Study Stars, along with Geovany’s love for learning has allowed him to make amazing progress with his reading. However, no one is more proud of Geovany than his mother, Viviana. She has been greatly involved in Geovany’s education, checking in on him and following-up on his lessons. Viviana is always willing to lend a helping hand at community events and stays involved in Geovany’s school. CHW has given Geovany and his family a place where they all can get the support they need in an environment that encourages them to pursue their goals. Geovany’s family hopes that he will one day be able to go to a college or university. While Geovany has a long time until then, with his passion for learning, and a community that loves and supports him, Geovany will definitely continue on a path towards success.